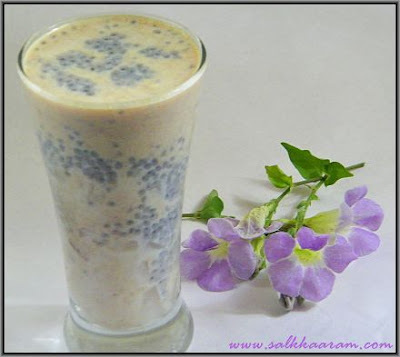 Dates Falooda | Simple and Delicious ! 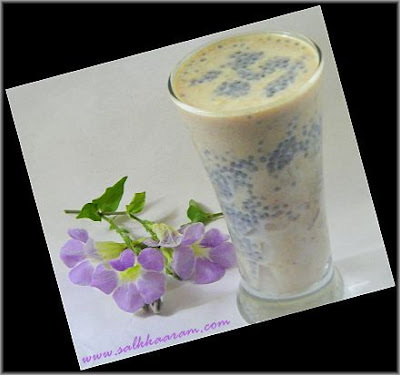 Here is a delicious and healthy falooda recipe from Ummi Abdullah. I got this from a magazine, tried out and loved it. You may see slight changes in the measurements, since I tried to make it easy for you, so converted the quantities to cups and spoons. Hope you enjoy! Soak dates in water for 1 hour. Soak sabja seeds in 1/2 cup water. Mix jelly according to the packet instructions and allow to set in the refrigerator. When it sets, chop it into small pieces. Take dates, remove seeds and chop into pieces. Blend together dates,milk, sugar and condensed milk. Put jelly pieces in the bottom of the glass. Put 2 tsp soaked sabja seeds over it. Pour the date shake above this up-to 3/4 of the glass. Add jelly and sabja seeds above this again. p.s. I didn't use raspberry jelly crystals, but used a white one, hence the color. I love falooda. This looks wonderful.